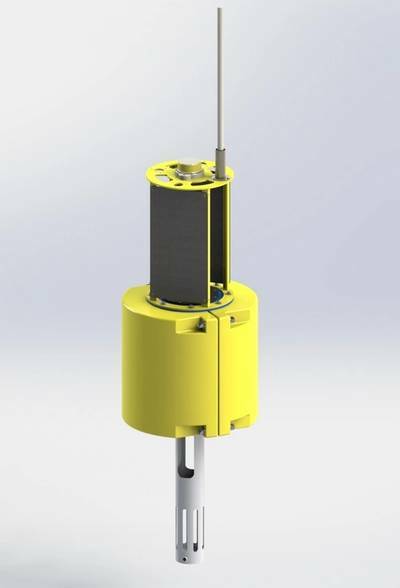 Ocean Scientific International Ltd. (OSIL) said it will introduce the latest incarnation of the Small Field Buoy at the Ocean Business show in Southampton, U.K. The platform, which is now a more maneuverable 55cm in diameter, also offers an improvement to the high visibility profile of previous platforms, meaning it is better suited to frequent redeployments in high-traffic coastal and port areas, according to the manufacturer. The buoy is suitable for all applications, including scientific studies, water quality monitoring, coastal engineering projects, harbor and coastal monitoring and maritime traffic control. The Small Field Buoy has been designed to be easy to handle, deploy and recover with an integrated grab ring, a total weight of around 35kg and 1.8m in length. The central structure safely houses sensors with excellent water flow, while providing protection from collision damage. The buoy can accommodate 4off 14W solar panels with battery back-up, datalogger and telemetry system(s), including UHF/VHF, GSM, GPRS and Satellite, with 60kg net buoyancy. OSIL provide a complete data telemetry solution, including either desk top or web-based software packages to access the data.